Posted on January 25, 2015, in liturgy and tagged calvary, latin mass, liturgical language, msgr. 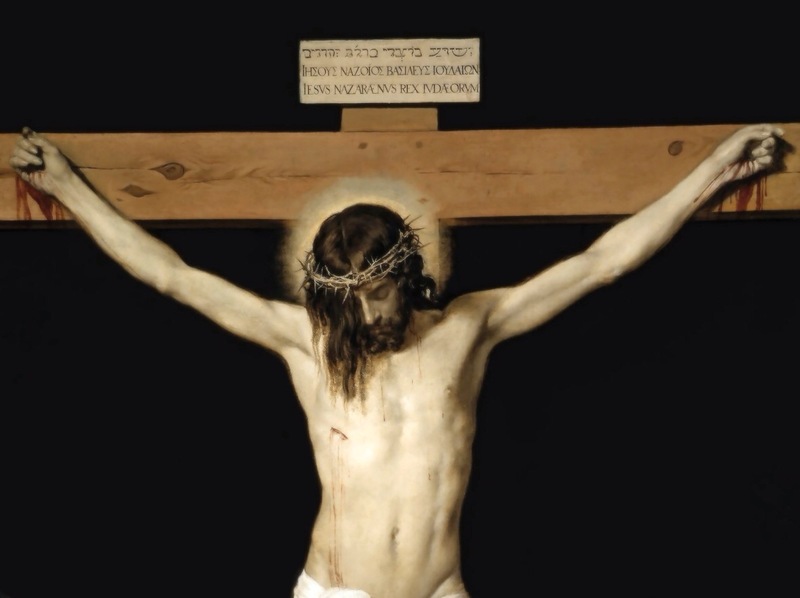 george moorman, titulus crucis. Bookmark the permalink. 6 Comments. The language of the liturgy is the very language of the cross. More than just a communal meal, the Catholic Mass is a sacrifice. Indeed, it is a re-presentation (and not simply a representation) of the once for all sacrifice of Christ our High Priest (Heb 9:28). What a sacred reminder we have been given by the Church through her use of language. As the Holy Mass transcends both time and space, the utilization of Greek, Hebrew and most especially Latin, assists us in recognizing our very participation in salvation history. The two statements are one. The mass in not just a representation, but it is in fact a what you said is a re-presentation of the Mass. Christ himself as the form of the priest and though space and time, we are there at the last supper. It is fascinating to me that what we are seeing is not a reenactment of what happen some 2,000 years ago, but it is happening now for the first time before our eyes because as you said the Holy Mass Transcends time and space. You see, I am a firm believer that Time only exists for man. It does not exist for any other creature. Birds do not fly south because a calendar reads October 30th, they do so because it is in their nature. No other reason. Only man have a need for time; it helps him understand what goes on around him. But it is not needed. Now, for God time does not exist. He moves according to his Holy Will. There is no portal, no door he has to enter. He wills any moment and it there. He wills creation to stop as it did just before our Blessed Virgin Mary responded to the Archangel Gabriel. For us, the response was immediate; however, for creation that is not bound by man’s silly, it was forever. Creation stood still. Therefore, what we witness at Mass is the actual events that happen. Very powerful if you think about it and as Catholic we are privileged to witness what very few have ever seen. Now, my comment about the article. I loved it because it was talking about the language of the Church. My comment extends to the language of the Holy Bible. The Holy Bible is the word of God and is everlasting. It cannot or should not every be changed. It needs to stay pure and holy. Only then does it help man. However, when we insist on changing his word to meet our needs, we lose it true meaning. We cannot improve it, you cannot improve perfection, and we however destroy it. Curse those who do… for they are not doing God’s work. I find that if the Bible is hard to read that is because the Holy Spirit is telling me to dig deeper into passage and find the meaning. The Bible that I use is the Douay-Rheims 1989 version of the Bible. For those who do not know: Pope Damasus assembled the first list of books of the Bible at the Roman Council in 382 A.D. He commissioned St. Jerome to translate the original Greek and Hebrew texts into Latin, which became known as the Latin Vulgate Bible and was declared by the Church to be the only authentic and official version, in 1546. The Douay-Rheims New Testament was first published by the English College at Rheims in 1582 A.D. The DR Old Testament was first published by the English College at Douay in 1609 A.D. The process was painfully long to transfer from Latin to English. Kings James used the Douay-Rheims bible in 1611 as a blue print for his version of the Bible. Then, the whole Douay-Rheims Bible was revised and diligently compared with the Latin Vulgate by Bishop Richard Challoner in 1749-1752 A.D. The notes included in the text (in italics) were written by Dr. Challoner. Many of the people who comment or made notes for the Douay-Rheims throughout history, were Doctors of the Church, Saints, Popes, Bishops, Priest; Holy men that walked with Christ everyday of their life. I have to physical copies of a Douay-Rheims Bible one printed last year; the another was printed in 1914. Both prints are exactly the same because, God’s Word does not. Both Bibles are in pristine conditions. They are used by me; however, I do not mark it up like a textbook with highlighters, underline text, make notes in the margins or use post-its. This is the word of God and needs to be treated and giving the respect that it deserves. Please understand this the next time you purchase a Bible. You want to get as close to the word of God as you can. I do know one thing the Kings James Version of the Bible has so many (admittedly) errors and should never be used. When my sister-in-law tried to give my daughter KJV of the Bible, they were quickly returned. Again, we must not tamper with perfection. If we do not understand, then learn what you do not know. Thank you for this thoughtful comment! Great insight into time and the Deity. Jesus, all broken up and suffering, is undergoing all that awful pain right now and knows each one of us and how we are reacting to Him there, along with His Mother and the few faithful friends. There is also a Traditional Latin Mass in Fargo, ND at the Cathedral every Sunday @ 14:00. If you are ever traveling in the Northeast, we have the Solemn High Mass here every Sunday 09:30 @ St. Mary’s Norwalk, CT. May God continue to bless your desire to deepen your faith to the Once and Future Holy Mass of St. Peter the Apostle. Thank you Father! Much appreciated! I’ll keep that in mind for sure!